My dear farming friends: For those who think farming is not renumerative, or for those who think it is the job of illiterate, dhoti-clad old men, the time has come for you to think again. The profile of many of today’s farmer is a natty, educated young man who has quit his lucrative career and taken up farming full-time. Take the example of young couple Partha and Rekha. Partha after getting a BE (Computer Science) and an MBA (Marketing and Finance) was working in the Software Services industry for over a decade. Though he was born into an agricultural family, he had always wanted to do things different from conventional chemical-based farming. He constantly troubled the family, forcing them to experiment with food processing and various farming methods. Change hit him hard when many members of his extended family contracted lifestyle diseases. A chance meeting with organic farming pioneer Nammalvar set the course of his life. After some convincing, his family gave him an acre of land to pursue his interest in organic farming and he has not looked back ever since. His wife Rekha, after finishing B.Com and an MBA, was employed in an MNC, managing their finance back office. She was helping to market the produce that was grown on the farm and was pivotal in planning the crop cycles. That was where the association with Restore started by chance. 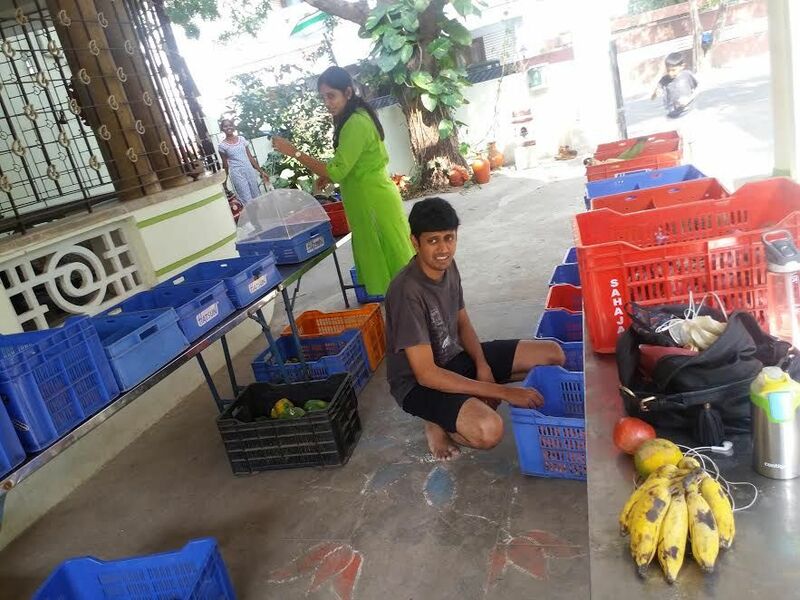 When the opportunity to set up Organic Farmers Market (OFM) along with Ananthoo, the brain behind the store, presented, she took it and set up an outlet in their garage in Chetpet. Their farm grows traditional rice, pulses and some vegetables. Their village is located in a village called Pandeswaram that is equidistant from Avadi and Redhills (12 km).Their store in Chetpet, which was part of OFM, is evolving to become a wholesaler; after they spent some time with quite a few organic retailers outside OFM. OFM does not pressure the farmer into ensuring deliverables are met. When there is a set requirement, farmers tend to indulge in inorganic practices and chances are that the vegetables can get adulterated. OFM only buys whatever the farmer has. If the farmer has very little of one vegetable and more of another, then that’s what they sell, buying whatever is available in bulk. OFM doesn’t sell packaged vegetables and allows customers to buy whatever quantity they want. The collective also focuses on reducing plastic usage, due to which customers have to bring their own bags. Customers are even expected to bring their own containers for oil. Members make it a point to visit at least two farms in a month and spend the whole day with the farmers, so as to make sure that no pesticides are used. The team also says that the time spent with farmers has helped to know them and their work better. Since the members are in direct contact with the farmers, the chances of adulteration and chemical usage are quite low. They ask farmers what prices they want to sell at and accept whatever price they quote. So sometimes the price could differ according to where it comes from. The collective also ensures that the farmers are paid immediately, with no delays, and prefer to work with small farmers as they can make a bigger difference to their livelihoods. OFM also makes sure that they procure native vegetables and don’t pressurise the farmers to grow any crops unsuitable for the weather. Their customers are also open to trying different kinds of rice every season. OFM strictly don’t sell hybrid rice since their aim is to save some of our traditional varieties by building a demand for it. Also our varieties have much more nutritional benefits. Big corporate organic brands invest a lot of money on advertisements, packaging and branding. OFM, however, does not spend any money on this, while succeeding in making healthy organic food available to all. Personally, as a farmer, OFM has and is my major marketing outlet for my different traditional rice varieties I grow in my farm. The payment is fast and mostly accurate. This is a unique concept in our country’s agriculture scenario today. It is more like a silent revolution where many educated young people are part of the OFM channel network and managing their own shops across the city. Partha and Rekha have also been working on generating rural employment. For starters, they have revived a women’s self-help group in Partha’s village Pandeshwaram, about 12 km from Chennai. These women are now engaged in making nutritious organic value adds, which are then passed on to other organic outlets in the city. Some of the things they produce are wheat flour, multi-grain mixes, millet flour, groundnut barfis, pepper vadas and other traditional snacks. In addition to all these activities, Rekha and Partha want to focus on reviving the community in their own village and hope to make it a successful model that could be emulated elsewhere. Some of their initiatives include restoring local water bodies, career counselling for children and soft skill coaching. This topic contains 0 replies, has 1 voice, and was last updated by Kalyanaraman M 5 months, 1 week ago.